There was a time where DC was all intense and dark, and Marvel was light and silly. Yet, over the years, Marvel got serious. And it was great. But a large part of me missed the silliness (and let's face it, we could all use a little silliness right now, if only for a couple of hours to escape the shitshow happening outside!). With Taika Waititi's Thor: Ragnarok, that silliness is back by the space-ship load. Waititi sets the tone early and it's evident that, for that time you spend in the cinema, all will be well. Big, bold moments are set up and immediately torn down with a witty one-liner that takes the legs out from under you and, despite some pretty twisted content, you're never really worried because you know you're in very safe hands. In this latest Thor outing, Australian actor Chris Hemsworth reprises his role as the God of Thunder and this time it's Mark Ruffalo's Bruce/Hulk who's along for the ride (with a few others from the MCU showing their faces again). The Thor/Hulk dynamic is absolutely joyous, offering some of the best gags of the film, and the friendship between Hemsworth and Ruffalo just bleeds right through into their roles on screen. It's cheeky and fun and an absolute delight to watch. Of course, along with the familiar faces, we have some new ones along for this intergalactic ride. And what a selection of cast members they've *ahem* assembled! Tessa Thompson (as Valkyrie) is both hilarious and badass. She has one of the best entrances of all the characters but builds on that initial impression layer by layer until you are completely behind her in whatever she does. Of course, our heroes would be nothing without some villains. And what a couple of absolute stars we have. Cate Blanchett is both horrifying and intriguing as Hela, the Goddess of Death. She's got a deadpan delivery that makes her fun and entertaining, even while she's slaughtering everybody in her path. And then there's Jeff Goldblum. Oh Jeff Goldblum. 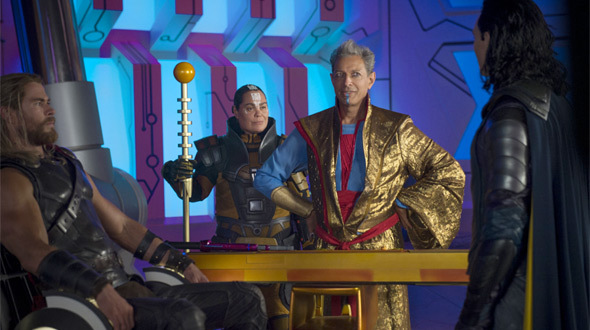 With colourful make-up and a smile, Goldblum's Grandmaster keeps his prisoners against their will (Thor included) and forces them to fight in gladiatorial matches, profiting from their demise. But he's just so friendly about it that it's hard not to love him. Despite this insanely impressive cast (seriously, imagine the dinner party! ), the star of the show is easily director Taika Waititi. As well as bringing audiences a fun, joyous film full of great laughs and seriously impressive effects, Waititi also appears in the film as CGI character, Korg. Despite serious competition from the others, Korg manages to be one of the highlights in a film full of great delivery. The plot isn't without its flaws, though. It jumps around from planet to planet and plotline to plotline and occasionally feels like an unnecessary thread was thrown in just for a one-line gag. The jokes are superb when they're built up and then taken down but when it comes to plot it feels strangely like you're being set up for an interesting thread that then isn't explored. And surely there are only so many times you can write off Loki's mass murderous ways with an eye roll and a "he's adopted" before you say enough. Of course, the overall film is such joyful and pure escapism that you just don't care when the tangent goes a bit too far. And Tom Hiddleston and Hemsworth still have that superb sibling banter, so I won't complain too much. The less you know about this hilarious film, the better. Do not look up anything that might spoil the surprises. No checking who shows up on IMDb or reading comments about the best in-jokes. There are so many brilliantly placed little treats littered throughout the film and each one is sure to have you cracking up – more so if you don't see it coming.